3.About Me Software Engineer working in the new Databricks engineering office in Amsterdam Opened in January 2017 So far expanded to 11 people and growing! 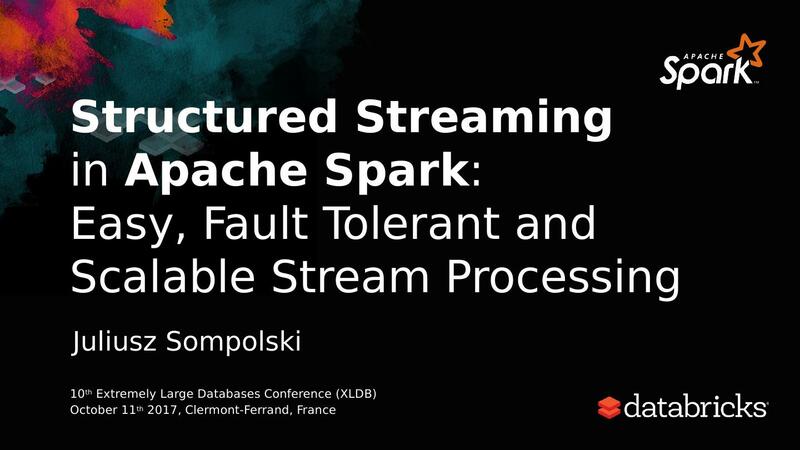 14.Anatomy of a Streaming Query spark.readStream Source .format("kafka") .option("subscribe", "input") • Specify one or more .load() locations to read data .groupBy($"value".cast("string")) from .count() .writeStream • Built in support for .format("kafka") Files/Kafka/Socket, .option("topic", "output") pluggable. .trigger("1 minute") ● Additional connectors, e.g. Amazon .outputMode(OutputMode.Complete()) Kinesis available on Databricks platform .option("checkpointLocation", "…") .start() • Can union() multiple sources. 15.Anatomy of a Streaming Query spark.readStream Transformation .format("kafka") .option("subscribe", "input") • Using DataFrames, .load() Datasets and/or SQL. .groupBy('value.cast("string") as 'key) .agg(count("*") as 'value) • Catalyst figures out .writeStream how to execute the .format("kafka") .option("topic", "output") transformation .trigger("1 minute") incrementally. .outputMode(OutputMode.Complete()) .option("checkpointLocation", "…") • Internal processing .start() always exactly-once. 17.Anatomy of a Streaming Query spark.readStream .format("kafka") Sink .option("subscribe", "input") .load() • Accepts the output of .groupBy('value.cast("string") as 'key) each batch. .agg(count("*") as 'value) .writeStream • When sinks are .format("kafka") transactional, exactly .option("topic", "output") once semantics. .trigger("1 minute") .outputMode(OutputMode.Complete()) • Use foreach to .option("checkpointLocation", "…") .start() execute arbitrary code. 21. Dataset/DataFrame SQL DataFrames Dataset spark.sql(" val df: DataFrame = val ds: Dataset[(String, Double)] = SELECT type, sum(signal) spark.table("devices") spark.table("devices") FROM devices .groupBy("type") .as[DeviceData] GROUP BY type .sum("signal")) .groupByKey(_.type) .mapValues(_.signal) ") .reduceGroups(_ + _) Most familiar to BI Great for Data Scientists Great for Data Engineers who Analysts familiar with Pandas, R want compile-time type Supports SQL-2003, Dataframes safety HiveQL You choose your hammer for whatever nail you have!